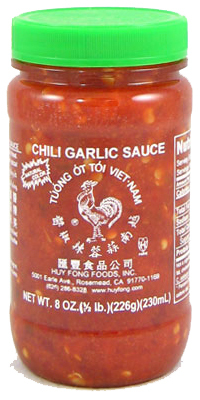 Huy Fong Fresh Chili Garlic Sauce is a tempting blend of coarsely ground chiles and garlic. Huy Fong Fresh Chili Garlic Sauce complements everything from a cracker to soups. Great for stir-frying or for spicing up your pasta meats, sauces or even pizza. Ingredients: Chili, Salt, Garlic, Distilled Vinegar, Potassium Sorbate, Sodium Bisulfate, and Xanthan Gum.